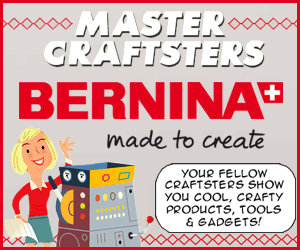 Craftster Community > MASTER CRAFTSTERS > BERNINA 3 Series > BERNINA 3 Series Master Craftsters Series! BERNINA 3 Series Master Craftsters Series! In this installment of Master Craftsters, five talented Craftster members -- Abbeeroad, kittykill, Leslieshappyheart, MissingWillow, and rlynn -- received sewing machines from BERNINA's 3 Series line of sewing machines. BERNINA has a machine just for you. Check out the amazing projects our Master Craftsters made! Got a hole in your jeans? Darn it! I Love the BERNINA 380! Re: BERNINA 3 Series Master Craftsters Series! Thanks, Bernina and congrats to our awesome Master Craftsters! You guys made SO many awesome projects! Thank you!! I STILL can't believe I was a part of such awesomeness. Thanks again for letting me play on this machine! I loved every minute of it! I am so impressed at the number and quality of the projects! I KNOW you guys worked hard, but also, that it was loads of fun! I love how you all described in real life the features of your machine....looks like there is a machine to meet the skills and needs of anyone who loves to sew! YAY for Bernina for offering choices! Love everything and even hope to try some of the projects out! Thank you so much for letting me be a part of this! This was fun, thanks so much for choosing me! This has been such a wonderful experience! It's been a pleasure and an honor to be a part of this Bernina campaign! Thanks for doing all the research, making great projects and for sharing it with us! Just to let you know, Craftsters ROCK! Congrats on creating such wonderful things and--yeah!--thanks for thinking of us with the tutes! Thank you, Craftster, for partnering with Bernina and other outside companies so we can have the benefit of testdriving all these products! Great job on all those projects, you wonderful crafsters! I cannot wait to look at each project! They are so many to look at and they all look so great!